Using the memory and display functions in your scientific calculator can help you use your device to its full capacity. By using the memory key, you'll be able to store long lists of numbers that you would like the calculator to file away while you're working on other problems. You'll also be able to use different buttons to display results. Most often, the "=" button will be used to display functions on your scientific calculator. Inspect your calculator for keys with a capital "M" symbol. These are your memory keys and most scientific calculators use several such keys, which may include Memory Plus (M+), Memory Input (Min) and Memory Recall (MR). Press "M+" to add the number on your screen to the memory of your calculator. 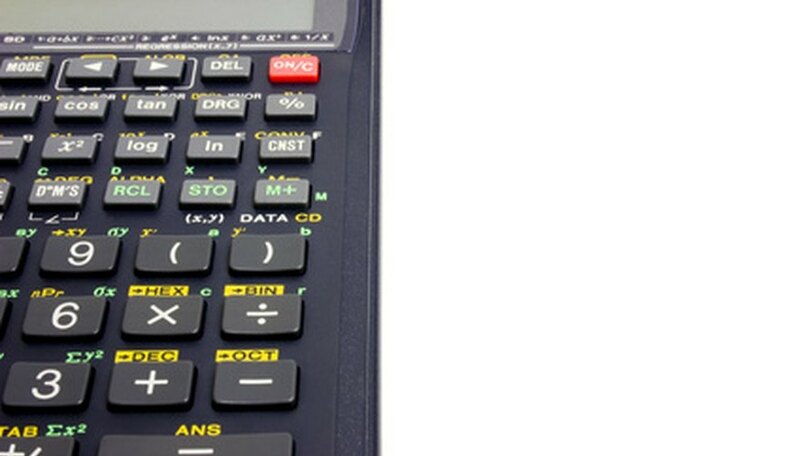 Most scientific calculators can hold up to ten memories. Press "Min" to input multiple numbers into the calculator's memory at once. Pressing the "Min" key when a given number is displayed will automatically input that number into the next available slot in the calculator's memory. Press "MR" to bring up one of the stored numbers. You can cycle through the various numbers by holding the "SHIFT" key and pressing the "MR" button. Clicking the above keys will automatically display the selected numbers on your calculator and make it easier to recall the numbers more quickly. Alexander, Jason. "How to Use Memory & Display Functions on a Scientific Calculator." Sciencing, https://sciencing.com/use-display-functions-scientific-calculator-7784680.html. 24 April 2017.